–Tom Dardis, Keaton: The Man Who Wouldn’t Lie Down. If you do any reading about early film comedy, sooner or later you’ll run into Clyde Bruckman. With the exceptions of Charlie Chaplin and the Marx Brothers, he worked with all the great early comedians: Buster Keaton, Harold Lloyd, W.C. Fields, Laurel & Hardy, the Three Stooges, Abbott & Costello. His name shows up in strange places—from X-Files episodes to the credits of Chris O’Donnell vehicles—but it appears most frequently in other people’s biographies, and usually all that’s there is his name. He seems to have only been interviewed about his career in film on one occasion, and only excerpts from that interview were ever published (once again, in someone else’s biography). Wikipedia says he was a failed director, an alcoholic, and a plagiarist, and there’s truth to that, but that account is incomplete and incorrect, starting with his date of birth. Everyone who worked with him is dead, but depending on whom you asked (and what year you asked them), he was either a comedy genius or a marginal figure in everyone’s career. Which is to say that the least charitable interpretation of his life is that he was a marginal figure in everyone’s career. He’s not a lost auteur—the kind of work he did bears little relation to what we now know as screenwriting, and no one’s ever said he was anything more than an adequate director. And he’s not a hero—his life ended in shame, dissolution, and tragedy. But at the height of his powers, Bruckman worked on a series of masterpieces that built film comedy as we know it today. The least history can do is remember his birthday. Clyde Adolph Bruckman was born in San Bernardino, California on June 30, 1894. Later in life Clyde wrote about the idyllic fishing and hunting trips he took in the nearby mountains as a child. He rather conspicuously didn’t write about his father, Rudolph Bruckman, owner and proprietor of the Sunbeam Saloon. In the early summer of 1911, Rudolph suffered a serious head injury in a car accident. By November of 1912, after months of blinding headaches and blurry thoughts, fearing institutionalization, he set his affairs in order, wrote a letter to his brother-in-law (“Say good-bye to the wife and boy. I hope they will have a happy life”), and shot himself twice in the chest in the alley next to his bar. Clyde, 18 at the time, was halfway through his senior year of high school. That spring, before he’d graduated, he began writing about sports for the San Bernardino Sun. He rose to sports editor in a year, and was hired to cover the 1914 baseball season for the Los Angeles Times. That summer, as World War I began, Clyde chronicled the fortunes of long-forgotten teams of the Pacific Coast League, whose names ranged from the unimaginative (the Los Angeles Angels, the Oakland Oaks), to the bizarre (the Venice Tigers, for some reason). Bruckman’s prose in these stories is occasionally purple and unintentionally funny—“Ty Lober spread wreck and ruin all over the local ball yard yesterday afternoon”—but compared to Grantland Rice he was Ernest Hemingway. His mentor was fellow San Bernardino native Charles E. Van Loan, a sportswriter and fiction writer (baseball stories, mostly) who was working at the time for the Saturday Evening Post. Van Loan was well-known enough that it became national news when he and Bruckman, returning from a camping trip that summer, drove a 1915 Buick off a 30-foot cliff. Bruckman was thrown free and only suffered bruises, but his friend went down with the car, suffering a broken jaw and compound fractures that were a contributing factor to his death several years later. There’s no way of knowing whether it was a pre-existing assignment or a freelancer’s ruthlessness, but 10 days later Bruckman published a piece in the Times about driving the San Bernardino mountains—which roads were most scenic, which could be dangerous “for the average driver”—without mentioning the accident. After the baseball season was over, Bruckman moved from the Times to the Examiner, and he and his mother moved to Los Angeles, where she managed an apartment building on Rampart. His first work in the film industry came in the late spring of 1919, when he was hired at Universal to write intertitles for comedies. It’s a mistake to think of this as being a job akin to modern screenwriting; the intertitles were written long after the story had been decided on. But they weren’t just a substitute for sound; they served narrative, and in comedies, contained jokes of their own. Intertitle writers weren’t often credited on-screen, and very little of Bruckman’s work from this period has made its way to the IMDb, but it shows up in contemporary newspapers. Over his tenure at Universal, he wrote for a wide variety of comedians as forgotten today as the Venice Tigers: Lyons & Moran, Monte Banks, “Bull” Montana, and Al St. John. 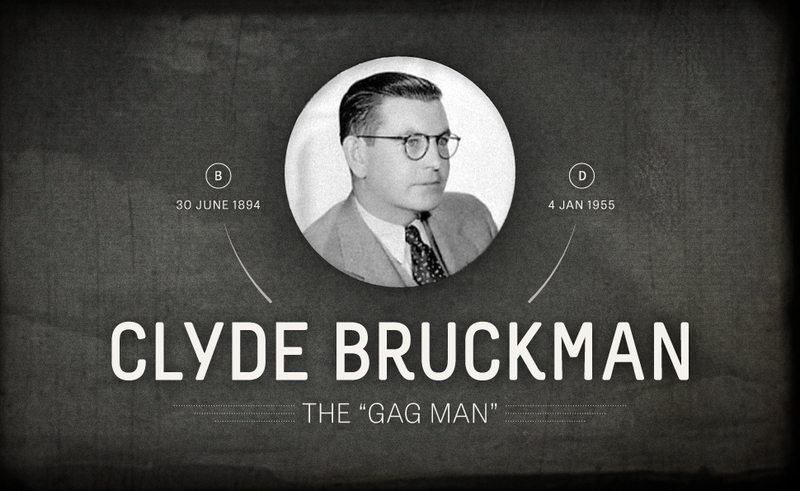 Bruckman didn’t cut ties with his old profession right away. September, 1919 finds him on a team of sportswriters in an exhibition game against a team of ringers led by local nightclub and gambling impresario Baron Long. He pitched 19 strikeouts, which is less impressive when you learn that the game ran for 18 scoreless innings before being called in the 19th on account of darkness. And it’s Bruckman’s byline on the wire story about Harvard, of all teams, winning the 1920 Rose Bowl. But in 1921, he finally got the opportunity to combine his interests. I was at Buster’s house or he at mine four or five nights many a week—playing cards, horsing around, dodging the issue. Then, at midnight, to the kitchen, sit on the sink, eat hamburgers, and work on gags until three in the morning. The second, maybe third, inning—with a runner on base—Bus would throw his glove in the air, holler, “I got it!” and back to work. Working for Keaton was lucrative as well as rewarding. By the time Bruckman left Keaton’s studio, he and Lola had moved to a house on Elm Drive in the heart of Beverly Hills (still standing). He did some freelancing during this period as well, notably taking a few months to do uncredited work on Harold Lloyd’s The Freshman. But his most important contribution to film history may have come from not from writing but from reading. I’d put one of my writers’ names—or something like that—on there. Says directed by…. Give ’em a promotion. I did that with… Clyde Bruckman because Lloyd didn’t know any better and hired him and kept him for about four pictures—four or five pictures. He was there for about three years, or something like that. But he turned out good for Lloyd, so there was no harm done. Made him a good director. But up to then he had no experience of directing at all. Keaton was misremembering this—he’d actually played the joke on Monte Banks and Hal Roach. Bruckman’s first directorial job was in early 1927, a few months after The General opened, directing Banks in Horse Shoes. But this job was also almost certainly acquired on the strength of The General, which by all accounts, Bruckman co-wrote but did not direct. Hal Roach also assumed Bruckman had actually been behind the camera on The General when he hired him that May to fix “Cowboys Cry For It,” a Eugene Pallette short that was testing horribly. Bruckman’s solution was to excise Pallette entirely and reshoot his scenes with Stan Laurel. The result wasn’t exactly a smash hit, but Bruckman continued to work for Roach, shooting two more shorts that summer—one with Oliver Hardy and one with both Laurel and Hardy as bit players. In September, he directed “Putting Pants On Philip,” the first film to bill Laurel & Hardy as a team. As the duo developed and refined their comic personas that fall, Bruckman directed them three more times, including in “The Battle Of The Century,” with its 3,000-pie fight. 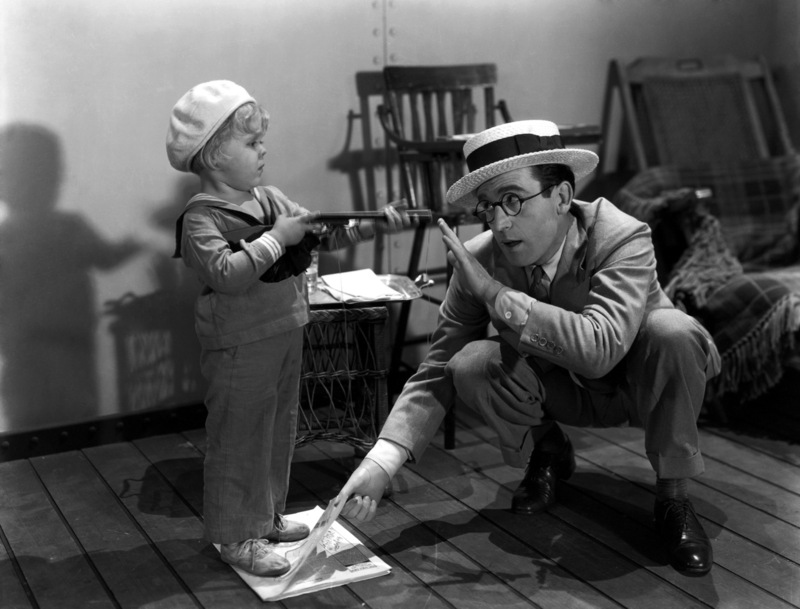 By the time Harold Lloyd hired him, Bruckman had learned how to direct. His first major job for Lloyd, in the spring of 1929, was transforming Welcome Danger into a sound film. About half of the movie had been shot silent, under the direction of Mal St. Clair, before Lloyd decided it was time to make the leap to sound. Bruckman didn’t know how to make a sound film, but then, neither did anyone else. The silent sections were dubbed over, poorly, an experience that Lloyd described as “an insane asylum.” Paramount didn’t like the results—nobody liked the results. One executive suggested test screenings of the silent and sound versions: “If the silent version is up to the standard of previous Lloyd pictures, I feel certain it will please the public much better than the dialogue version.” He was underestimating the public’s curiosity to know what their favorite movie stars sounded like. Even if Lloyd’s lips didn’t match the audio, hearing his voice was worth the price of a ticket. Welcome Danger may have been a failure from a technical and artistic standpoint, but it was a financial success. The follow-up, 1930’s Feet First, also directed by Bruckman, made less money, but was at least conceived as a sound film from the beginning. But before production could begin on Lloyd’s next film, Clyde Bruckman’s troubles began. I got one of the gag men to direct and he had a little difficulty with the bottle and we practically had to wash him out and carry on… But I still give the credit to this other boy, the gag man, for it. Whoever was behind the camera, the film is easily Lloyd’s best talkie, and has a showstopping crane shot that’s as fluid and graceful as anything else for decades. In March, during the film’s production, Bruckman married Gladys Marie Prevost Meals, the daughter of French immigrants. It was Gladys’s second marriage as well, and may have been abrupt for both of them—immigration records show Gladys’s first husband returning from Agua Caliente (run at that time by Baron Long!) just a few weeks before her wedding. Patrons could gamble there, but they could also get a quick divorce. Lola had died less than six months before. But however quickly things started, they lasted: Gladys and Clyde remained married until his death. Stories about the progression of alcoholism all follow the same blueprint, and Bruckman’s is no exception: gradual slips that mark a long-term decline. After Movie Crazy, Bruckman went to work for W.C. Fields—or more accurately, he went to work against him. He was hired by Mack Sennett to shoot reaction shots to splice into Fields’ short “The Fatal Glass of Beer,” when Fields refused to recut it himself. Bruckman managed to get sole directorial credit although a finished version of the film existed when he was hired. Apparently Lloyd didn’t have any hard feelings about Movie Crazy, since he rehired Bruckman to write for the The Cat’s-Paw in 1934. Fields didn’t hold a grudge for being recut, either; in 1935 he hired him to direct Man On The Flying Trapeze. Production began in April of 1935. Regardless of the details, the bloom was off the rose, and Bruckman couldn’t get further work as a director. He ended up in the short-subject department at Columbia, writing gags for the Three Stooges. In the popular conception of his life, Bruckman’s alcoholism had progressed to the point that he could no longer produce new material, and so he secretly, shamefully started to plagiarize old gags from his days with Keaton and Lloyd. This isn’t quite right—it may be true that he was too drunk to come up with anything new, but there was nothing secret about what he was doing. Remember how gag writing worked: a group of people batting around ideas, not caring too much who got credit for them. Bruckman thought of what he’d done for Keaton and Lloyd as being stage business—not stories, not words, not plot or character or anything literary. The studios, too, reused gags routinely—looking at the Stooges scripts from the 1940s, I found handwritten notes in producer Jules White’s handwriting on the covers, with dates from the early 1950s, noting things like “good story to regag.” It wasn’t an uncommon practice. In 1942, Bruckman wrote a Three Stooges short called “Three Smart Saps” that reused what was known as the basted tuxedo routine from The Freshman. In both films, a character ends up wearing a tuxedo that hasn’t been sewn together properly, and hilarity ensues. It’s a different character, a different tuxedo, different plot (or in the case of the Stooges, a different “plot”). But it’s recognizably the same gag. “Loco Boy Makes Good” contains a gag from Movie Crazy, a sequence in which a character mistakenly picks up a magician’s coat instead of his own, and over the course of the next scene, eggs, mice, and other props from the magician’s act drop out of the sleeve. Hired by Universal to write comedy bits for its musical revue films, Bruckman reused the same gags again, in She Gets Her Man, Her Lucky Night, and So’s Your Uncle. Columbia and Universal knew what he was doing; no one thought they were doing anything wrong. …the story of his pictures meant nothing, only the comedy which was created, for his personality was important, that is, that the drawing power of his pictures was the personality of Lloyd as a star—and that since he was not a present-day box office attraction, the picture did not have the values that Lloyd was testifying to as an expert witness for the appellant. In other words, they wanted to make a legal argument that box-office receipts were driven by star power, Lloyd’s career was over, and old movies weren’t worth anything anyway. The judge wasn’t exactly a movie buff himself—during the trial, he made several statements along the lines of “this Court is not accustomed to dealing with figures that they deal with in Hollywood. They always have a couple of extra ciphers on anything they deal with out there.” At one point, he described Lloyd’s request for damages as being as meaningless a figure as the national debt. In the end, nobody got what they wanted. The judge found that the infringing films copied so much from Lloyd’s originals that calling it stage business wasn’t an adequate defense: Universal and Bruckman had infringed on Lloyd’s copyrights. But instead of the $1.7 million in damages Lloyd had asked for, he was awarded only $40,000, less than he’d asked for in legal fees. Lloyd appealed, and the case went to the 9th circuit, but the lower court’s decision was upheld. Some versions of Bruckman’s story start using the word “blackballed” at this point, but he continued to write Three Stooges shorts for White even after the Columbia lawsuits. It’s not entirely true to say the world of features was closed off, either—Variety has him working on Abbott & Costello’s The Noose Hangs High, although he didn’t get a credit. All the different versions of Bruckman’s story agree on one point: His drinking, already bad by the mid-1930s, worsened significantly after losing the lawsuit. Oddly enough, it was Harold Lloyd who got Bruckman another chance in 1949. According to Lloyd’s agent Ben Pearson (by way of Keaton biographer Tom Dardis,) Lloyd was working in radio at the time, and in a conversation about the new medium of television, said he thought Keaton’s visual jokes would be well-suited to TV. Pearson agreed, and reached out to Keaton through Bruckman. By 1949, Keaton was a long way away from the man who built an Italian palazzo in the middle of Beverly Hills: He immediately asked Pearson for $250 to get through the week. 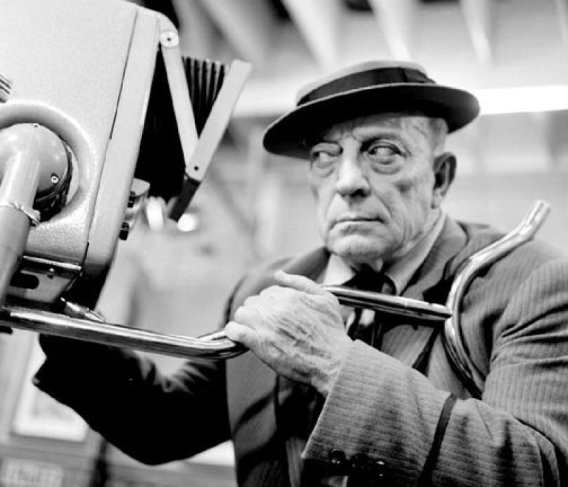 Keaton, Bruckman, and Pearson put together The Buster Keaton Show for KTTV, and on December 22, 1949, it premiered to glowing reviews. (Variety called it “must-see.”) Studebaker picked up the sponsorship, and it began running weekly on Thursday nights. On its face, this was the perfect job for Bruckman, because the show was explicitly designed to reuse old Keaton gags (which he owned, so there was no risk of lawsuit.) According to Dardis, “Bruckman’s writing was mostly on the order of introductory spoken material to set the scene for the classic comedy routines.” But even this proved too much for a man who at this point was carrying a pint bottle around in his jacket pocket all the time. Bruckman couldn’t meet deadlines, Harold Goodwin and Eddie Cline had to be brought in to finish his work, and in April, the show went off the air. Bruckman made a few more attempts at recycling old silent gags for television, picking up a producing credit on Life With Buster Keaton, a version of The Buster Keaton Show that was filmed for syndication instead of being broadcast live. He also wrote, again for KTTV, for the second season of The Abbott & Costello Show (work that Variety described as “the comedy of least resistance”). He tried and failed to talk Laurel & Hardy into putting together a similar show. And he drank, and he drank, and he drank. That road came to an end on January 4, 1955. Sometime between 3:00 and 3:15, Walter Brown, a bartender at Bess Eiler’s Restaurant, heard what he thought was a car backfiring on Santa Monica Boulevard. It took 10 minutes before he connected the noise with the customer who’d gone into the men’s room but hadn’t come out. The police found a neatly typed note in Bruckman’s jacket pocket, containing detailed instructions for returning his car to his wife, contact information for friends of the family so Gladys wouldn’t have to get the news from a police officer, a request to donate his body to medical science as he had no money for a funeral, and finally, an explanation for the gun he’d used, to save them time investigating. (He’d borrowed it from Buster Keaton, telling him that he was planning a trip “and would feel safer having a gun in the glove compartment.”) He’d chosen Bess Eiler’s so Gladys wouldn’t discover his body or have to deal with the cleanup. Just like his father, Bruckman carefully thought about the logistics of his own exit. And thought, and thought. The letter had the date typed as December 26, then corrected in pen to January 3—it was now January 4. Everyone’s life is the story of learning you don’t have that particular lamp. But let Clyde Bruckman have it. Go past the man with the neatly typed note in the bathroom stall, past the loans and the television shows and the lawsuits, past MR. BRUCKMAN’S ABSENCE ON ACCOUNT OF ILLNESS and Queen of Angels Hospital, past flasks and bottles and crystal decanters and years and years of monotonous failure. Here’s where the lamp takes him. He’s 31 years old, living with Lola, the woman he married at 22, back when they were practically kids. He and Jean Havez and Eddie Cline and Joe Mitchell and Buster Keaton are at each other’s houses ’til all hours, cooking late-night meals, throwing anything they can think of at the wall, writing jokes that will outlive them by decades, inventing the cinematic language of comedy. He won’t shut up about this book he’s reading about a train. On warm afternoons they play baseball. 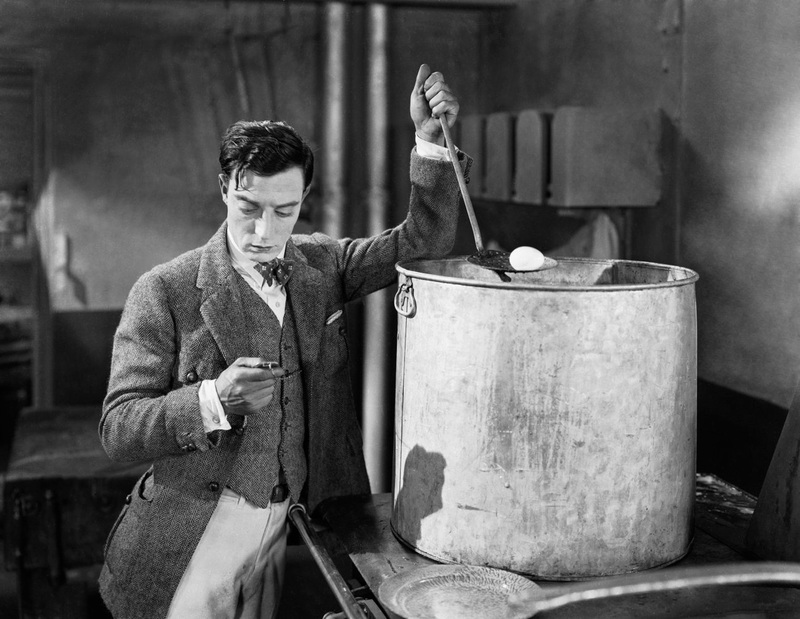 Our Movie Of The Week look at Buster Keaton’s Sherlock, Jr. ends here. Don’t miss Tuesday’s keynote on the film’s masterful use of framing and geometry, and Wednesday’s staff forum. Next week, we’ll take up with the brilliant vulgarians of A Fish Called Wanda.